As per the provisions of Section 139(6) of the Companies Act 2013 the first Auditor of a company, other than a Government company, shall be appointed by the Board of Directors within thirty days from the date of registration of the company and on failure to do so, members of the company, shall appoint the same within ninety days of incorporation at an extraordinary general meeting, who shall hold office till the conclusion of the first annual general meeting. As per the provisions of Section 139(1) of the Companies Act 2013 every Company shall, at the first annual general meeting (AGM), appoint an individual or a firm as an auditor who shall hold office from the conclusion of that meeting till the conclusion of its sixth annual general meeting. However matter relating to such appointment shall require ratification by members at every annual general meeting. 2. Where a company is required to constitute the Audit Committee, the committee shall recommend the name of an individual or a firm as auditor to the Board for consideration and in other cases, the Board shall consider and recommend an individual or a firm as auditor to the members in the annual general meeting for appointment. 3. If the Board agrees with the recommendation of the Audit Committee, it shall further recommend the appointment of an individual or a firm as auditor to the members in the annual general meeting. 4. If the Board disagrees with the recommendation of the Audit Committee, it shall refer back the recommendation to the committee for reconsideration citing reasons for such disagreement. 5. If the Audit Committee, after considering the reasons given by the Board, decides not to reconsider its original recommendation, the Board shall record reasons for its disagreement with the committee and send its own recommendation for consideration of the members in the annual general meeting and if the Board agrees with the recommendations of the Audit Committee, it shall place the matter for consideration by members in the annual general meeting. 6. 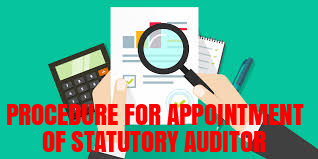 Intimate the proposed auditor(s) regarding the intention of appointing him/it as auditor and ask whether he/ it is eligible and not disqualified to be appointed as auditor of the company. Before such appointment is made, the written consent of the auditor to such appointment and a certificate from him must be obtained. 7. The auditor appointed in the annual general meeting shall hold office from the conclusion of that meeting till the conclusion of the sixth annual general meeting, with the meeting wherein such appointment has been made being counted as the first meeting. Provided that such appointment shall be subject to ratification in every annual general meeting till the sixth such meeting by way of passing of an ordinary resolution. 8. The company shall inform the auditor concerned of his or its appointment, and also file a notice in Form ADT-1 of such appointment with the Registrar within fifteen days of the meeting in which the auditor is appointed.